The first time I heard Norm Nathan was on a New Year's Eve. I'm not sure of the year. I was around nine years old so it was around 1964. It was the first time my parents had allowed me to stay up until midnight. They had gone out for the evening and my siblings were asleep. It was just me and my Aunt Eva, my mother's aunt, so I guess you could call her my great aunt. She was in her seventies and we were best friends. We'd made popcorn and watched TV and now we were listening to the radio to hear the New Year rung in. As always in our house in those days the radio was tuned to WHDH, my parents' favorite station. We were listening to Norm's program "Sounds In The Night" which started at 11:30 p.m. My memory of this is hazy but just before midnight Norm did some sort of countdown and then chimes or a church bell rang out twelve times. When the bells stopped at exactly midnight Norm said something - I don't recall what it was. But it must have been profoundly silly because I do recall my aunt and I were both doubled over with laughter. Here we were, a nine year old kid and a woman in her seventies and both of us had been reached by this voice on the radio. For the next few years any time I was allowed to stay up past 11:30, or we were in the car at that hour on the way home from a trip, I would listen to that voice. When I was in my early teens and WHDH moved Norm to afternoon drive I would listen to him every day when I got home from school. When I was in high school and they moved him to middays I could only hear him during vacations or when he'd fill in for Jess Cain on the morning show. That wasn't enough. So when my best friend Alan got a car...uhm...as Norm would say, come closer because I don't want everybody to hear this, we used to skip class and sit in his car and listen to Norm's show. I first met Norm Nathan in December of 1973. I was 18 years old, a freshman at Emerson College and I'd just landed a slot as the co-host of a weekly comedy/variety show on the college's FM station, WERS. The first thing I did was to write a letter to my Radio Hero, Norm Nathan, to see if he would consent to an interview. A week later I was sitting in Norm's windowless office at WHDH hardly able to believe it! I was nervous as this was the first interview I'd ever done. I was really hoping I didn't ask any stupid questions. Norm was wonderful and the interview went great. He laughed at the questions that I'd hoped he would laugh at and he gave me great tape. My friend Alan had driven me to the station and Norm had made us both feel at home and spent quite a bit of time talking with us after the interview was over. (A couple of years later Alan told me he was at some event that Norm hosted and went up to introduce himself afterward and Norm remembered him and they talked like old friends.) The interview aired on our first show. A few weeks later I got a letter from Norm - a fan letter! He'd been listening to the show every week and liked the comedy we were doing and wanted to know if...er, maybe there was a way he could be on the show again? Of course we had him back! This time he was in the studio with us and he took part in our comedy bits and played some silly characters. I'll never forget the day he came over to WERS to record his bits for the show. There was one sketch in which Norm would play himself in the the lead role. The two of us were sitting in this tiny production studio getting ready to record. I handed Norm the script - which I had worked very hard on - and he read it silently. Silently! This was a comedy script! I was beginning to panic, thinking "He hates it. He probably wishes he'd never agreed to do this. He must be right - it must stink!" He just kept reading, silently. I finally spoke up and said hesitantly, "I tried to write it in your style." "I know," he said, "This is amazing! I've never seen it on paper before!" Norm appeared with me a number of times on WERS during my four years in college. Several times he took part in on-air fundraisers for charity during my jazz program. Every time he was on we'd get more contributions than in any other hour of the week. In my senior year Norm helped me get an internship at his new station, WEEI. Later I was hired as a newswriter and producer. My first assignment in the latter role was as Norm's producer, setting up his interviews. We had similiar interests - radio, jazz, baseball, politics - so we worked together very well. And, although I must have been as green as the outfield grass at Fenway Park, Norm treated me as a peer. I certainly hadn't earned that kind of respect yet but that's the way Norm was. His celebrity and talent never went to his head. I remember once we were headed out to lunch after work and he had to stop at the bank to cash his check. He's standing at the teller's window talking to me while the teller - a guy in his twenties - recognizes Norm from the TV show he was doing at that time. I could see the excitement on this guy's face - he couldn't believe he was waiting on NORM NATHAN! Hey, I knew how he felt. But Norm was oblivious. The teller was extremely polite and efficient and Norm thanked him and as we walked away Norm said to me, "That was the most enthusiastic teller I've ever seen." I said, "He obviously recognized you from TV." Norm had had no idea and now he felt embarassed that he hadn't said something besides thank you. "I'm such a putz," he said. Two pictures come into my head when I think back to WEEI in 1977 and both of them involve Norm's wardrobe. Newsrooms were pretty tough rooms in those days. The ribbing could be merciless! Once Norm came in dressed in a white shirt that was covered with the autographs of great jazz artists: Ella, Dizzy, Bird, Miles, Trane. It was a wild-looking shirt and he heard about it all day from his colleagues. Another time on a day when the WEEI Softball Team had an evening game, Norm - who was the team's starting pitcher - came in and anchored the news wearing his uniform. On the back it had his nickname. You're probably thinking it said "The Old Sport." Uh-uh. "Stormin' Norman" is what it said. Norm's style of dress was often a topic of conversation among his colleagues when Norm wasn't around. But Norm knew he'd never make the cover of GQ and didn't care. While he was working at WEEI, Norm also co-hosted a weekly TV show on WCVB Channel 5 Boston called "Sunday Open House." Another personality at the TV station, Frank Avruch, a very nice man and a long time friend of Norm's, was known for his good fashion sense. He would appear as the host of the station's movie series dressed in a tuxedo. Earlier in his career Avruch had played Bozo the Clown on Channel 5. One day we were talking about the TV show and Norm told me that it was written into his contract for "Sunday Open House" that he couldn't pick out his own clothes! "The station pays for the clothes I wear on the show so they're not about to trust me. They make Frank Avruch go with me when I buy my suits." As I chuckled at that Norm went on, "I guess it's pretty sad when the boss wants some Bozo to choose your clothes for you." Over the years Norm interviewed the comedian/writer/musician/actor Steve Allen a number of times. If you ever heard them together you could tell there was mutual respect and I know Norm really enjoyed talking with Steve. So here's a little piece of trivia I'd like to brag about: I'm the guy that set up their first interview. I wish there was a great story to go along with that fact but I don't recall anything unusual about making the arrangements. Just a little footnote to The Norm Nathan Story. The thing I'm most proud of from my time at WEEI is a documentary I wrote and produced called "Thinking Back: Boston Radio in the '40s and '50s." There had been many specials on both radio and TV in the 1970's about the network shows in the "Golden Days of Radio" but I'd never heard one about local radio. I had come up with the idea for the show a couple of years earlier and thought about producing it for the college station but it never happened. So, on my first day on the job at WEEI, I went in and pitched the idea to the boss, Mike Ludlum. I still can't believe he let me do this. I was 22, a part-time newswriter, still in college, and I'd never produced a documentary before, but he said yes. As I look back I figure Norm must have gone in and talked to him about me, either about that show in particular or about my talents in general. Whatever...I got to do the show and better yet - Norm would be the host! We had a ball working on that show. We interviewed Bob & Ray, Curt Gowdy, Leo Egan, Arch MacDonald, Sherm Feller, Tom Russell and others. I found a guy who taught at Keene State College in New Hampshire named Lou Dumont who had worked at WCOP Boston in the 1940's and who had made what were now rare recordings of the local broadcasts of the time. Lou provided us with the tapes and we put together a wonderful half-hour show. After several weeks of preparation the day came to record the program. It was a lot of work and we were in the studio for several hours. Norm was great and looked to me (ME!) for direction constantly. "Am I doing this okay?"... "Is that how you want me to read that?"... "I think I muffed that one. Let's try it again." You couldn't find an easier person with whom to work. Norm had also had to pull his regular shift so he'd had a really long day. After the recording session was over and I finished packing stuff up, I was getting ready to leave and stopped by Norm's desk to say thanks and good night when he said, "Kid, let me buy you a drink." We went across Boylston Street to J.C. Hillary's to sit at the bar and discuss the show and how it had gone. When our drinks arrived Norm Nathan - my Radio Hero - lifted his glass to me and said, "Steve, I've been in this business for thirty years and that was the best damn show I have ever been associated with." I was speechless. After I left WEEI to pursue an on-air career Norm always stayed in touch. We'd write letters regularly and talk by phone from time to time. Anytime I called Norm - from some outpost like Geneva, New York - he'd always make me hang up and he'd call me back so he'd be paying for it. I'd send him airchecks (tapes) of my work and he'd send me critiques. When I landed a job at ABC News in 1980 I came home to visit my folks for a few days before starting the new gig. I phoned Norm and he invited me to come in to WHDH where he was back on the overnight shift, doing a talk show for the first time. My Dad drove me in and there we were, sitting in studio as Norm began his show. After his opening remarks Norm shocked me by introducing me as his special guest, "a young newsman who's just been hired by ABC News and was nice enough to stop by before heading to his assignment in New York." Norm interviewed me for a bit and then started taking calls. He included me in the conversation too. The callers didn't know who I was and didn't care but Norm acted like I was his co-host. At 3 a.m. we were about to leave. Norm thanked me on the air for being with him that night and then opened the microphone nearest my Dad and said, "Steve's father's been sitting here quietly all night long. Why don't you say hello to the audience." My Dad was not expecting this and began to say, "Yeah, this is Steve's father -- " but that's all he got out because Norm interupted him. "All right Steve's father, that's quite enough. I had no idea you were going to ramble on like that." We all cracked up. Once when I was back to Boston for a visit, I was meeting Norm for dinner. He asked me to meet him at his new station, WMRE, which was located in the Fenway Park building. I got there toward the end of Norm's shift as he was doing his final on-air breaks and putting away his carts (recorded music). "I hate for you to see me like this," he told me. He hated that station and everything about it. "Everyone thinks I must be happy because I'm a DJ again and I'm playing these old songs. But we're not playing any of the good old songs, we're playing all the crappy ones." His shift ended and we went back to the disc jockey office so Norm could collect his things. We sat in Norm's cubicle and talked for a while. Eventually a WMRE colleague came in to the office - Bill Marlowe. Marlowe was another Boston radio legend who, in his time - which was about thirty years previous - was pretty hot stuff, a local star. He had one of the biggest voices in the world. But he also had one of the biggest egos in the world so a lot of radio people didn't like him. Norm was one of them. Now, you've got to know a couple of facts before I continue. First, as I said, I'd been working in New York so I had no idea that Marlowe was working at WMRE and, although I'd heard him on the radio in the past I'd never seen him before, so I had no idea who this guy was that was walking toward us. Second, Norm did an unbelievably funny impression of Bill Marlowe and had entertained me with it many times over the years. Now, back to our story... Norm turns casually and says, "Bill, I'd like you to meet a friend of mine, Steve LeVeille, from ABC News in New York." Bill, ever gracious when meeting somebody who might be important, immediately offered his hand and as I shook it Norm looked at me with a straight face and said, "Steve, meet Bill Marlowe." I tried not to flinch as I exchanged pleasantries with Bill. It was all I could do not to burst out laughing! Then to make it worse Norm, who now was standing slightly behind Marlowe, started making silly faces at me, and on top of that, all I could think of was Norm's Marlowe impression. And now I'm listening to Marlowe talking to me and it sounds just like Norm's impression! I have no idea what I said to Marlowe and no idea how I was able to hold in the laughter. A few minutes later when we were safely outside the building I lost it, cracked up, and couldn't stop laughing. "What's so funny?" Norm asked knowingly. "You (expletive deleted)!" I replied. We both laughed all the way to Kenmore Square. We stopped at a bar to meet up with another friend, Mike Ludlum, our old boss at WEEI and by this time a big wig at WCBS New York, and the three of us headed off to the restaurant. It was a classy restaurant and gentlemen were required to wear jackets. Mike was dressed in a suit as he'd just flown in from New York after work. I was wearing jeans but also a sportscoat. Norm, who as mentioned earlier was never known as a snappy dresser, had a dress shirt and slacks. The maitre'd wouldn't let Norm in. Here's Mike and me, just a couple of guys, with Norm - a real celebrity who had already been recognized by a couple of other customers as we'd entered the restaurant - and Norm's the one who can't get in! "What do you mean, I can't come in?" Norm asked the maitre'd angrily. "I'm sorry sir but gentleman must be dressed appropriately," was the response. Norm was steamed. He pointed to me and said, "But he's wearing blue jeans." "I can see that sir but we require a jacket," was the reply. Mike suggested we go somewhere else. But Norm was now adamant about dining here. He turned to the people in line behind us and said sheepishly, "I'm sorry to make you wait but I'm not dressed appropriately." After we hemmed and hawed about what to do for a minute the maitre'd finally said, "We could provide you with a jacket, sir." "Oh," Norm repeated to Mike and me, "they could provide me with a jacket." Turning back to the maitre'd Norm said, "Do you have something in a nice charcol gray? If not I'd settle for navy blue." The people behind us giggled as did Mike and I, and the maitre'd said, "I'll see what we can do sir." So we all moved over to a closet by the coatroom and someone from the staff helped Norm into this thing that looked more like a sweater than a jacket. I think it was the only thing in the closet. "Do you think he'll let me in with this? It's not really a jacket," Norm said to the attendant who just shrugged. We walked back over to the maitre'd and Norm said, pointing to his sweater, "I kind of like this, can I buy it?" The startled maitre'd said, "I don't know sir. May I seat you now?" 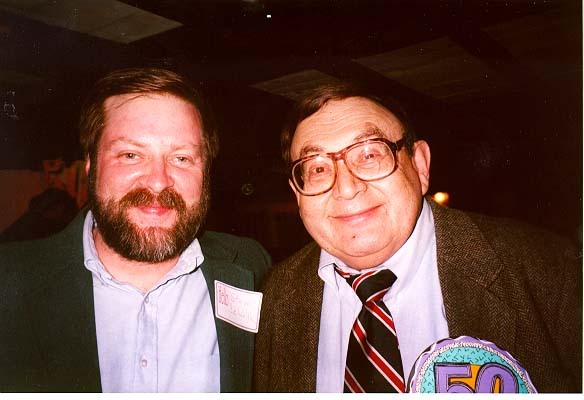 Steve LeVeille with Norm Nathan at Norm's "Fifty Years in Broadcasting" Bash. In 1991 I joined WBZ as a talk show host. I still have the Air Schedule from my first week at the station - not because it was the first time I was on a WBZ schedule but because it was the first time I was on the same schedule as Norm Nathan! We had worked together 14 years earlier at WEEI but now to be an on-air colleague of Norm's...well, I guess it was a dream come true. In those days the best part of working at WBZ for me were the times that I'd work the shift just before or just after Norm. Then we'd get to do what's called in radio lingo, a "cross-over." That's when the host of the show that's ending chats for a few minutes with the host of the show that's about to start. With Norm and me, as some of you may remember, it was never for "a few minutes." Whenever I'd fill in for David Brudnoy on Friday nights, Norm would be my relief. I'd come out of the studio with my stuff to make way for him and he'd say, "Get back in there. You're going to be on with me." If he had a guest scheduled at the start of his show, the guest would have to wait. Norm would talk with me for 30 to 45 minutes. If I do say so myself, and I do(! ), it was great radio. We'd talk about the topic I'd just finished doing in the previous hour or the one he was going to do on his show or about the Red Sox or radio or music or whatever was happening in Boston that week. The conversation would be filled with jokes and laughter. I started getting fan mail from listeners who would write that their favorite time of the week was when Norm and I were on together. Norm was also getting this kind of fan mail. Although I was on the air with him a number of times over the years I've often wished we could have done a show together on a regular basis. We talked about it a few times and actually tried to put something together once but it was one of those things that just didn't work out. The most difficult moment I've ever had on the air was on my old Saturday afternoon talk show on WBZ. The newsroom alerted me that they'd just received word that Norm's wife had died. If you don't know about her, this was big news. Norma Nathan was the top gossip columnist in Boston for many years. She had been ill for some time so the news was not unexpected but I certainly hadn't given any thought to the possibility that I'd be on the air when it happened. My newscaster, Jaqueline Goddard, went to the news studio to do the bulletin. We just happened to be in a commercial break as she was doing so, so I said to her on the intercom, "Jacquie, when you're done - stay there. I think I might need some help for a few minutes." I was right. As Jacquie aired the news bulletin and gave the details, I was sitting in my studio worrying about Norm. "Where is he right now? Was he with her when she passed or did someone have to break the news to him? How's he holding up? He loved her so much. How is he going to get through this?" And then, suddenly, Jacquie was done and it was time for me to go back on the air. I started by talking about Norma directly to Jacquie so that she would have to respond. My voice wavered and I was grasping for the right words. Jacquie was a real pro (she went on to become Mayor Menino's press secretary) and she helped me get past those first few minutes. But hey, she had a breaking news story going and she had to get back to the newsroom and start working the phones. So I thanked her and continued talking and started telling some stories about my encounters with Norma and I asked the callers to "give me a hand" in getting through the rest of the program. And they did. In 1996 I was working for Monitor Radio, covering the presidential campaign. In October I spoke with Norm on the phone. Although he hated talking about it on the radio Norm loved to talk politics off the air. He wanted all the details of the stories I'd been working on and what I was doing next and we discussed the campaign in general. He wanted to get together for dinner but I was about to leave town to do some reporting in the midwest. Then I'd be back in town for two days to file some stories and then right down to Washington to cover Bob Dole's headquarters on election night. We made plans to have dinner in November, the week after the election. I got back from Indiana late one night and was up early the next morning, at the computer writing my story on deadline and talking with my editor on the phone. My wife was getting ready to go to work. Diane came in and said, "Steve, I just heard on 'BZ that Norm died." I was stunned. I told my editor what had happened and said, "I can't write this right now. I'll call you back." An hour later I called him back and resumed my work. Life went on, radio went on. But it's never been the same.